Beautifully engraved SCARCE certificate from the Government of Palestine issued in 1944/45 for 10 Pounds. This historic document has an ornate border around it and has the printed signatures of the Director of Bond Issues and Financial Secretary and is over 63 years old. The certificate is written in Hebrew, English and Arabic. The bond was issued subject to the War Loan (Bearer Bond ) Ordinance. It was a lottery bond where the results would be issued by the Accountany General in Jerusalem and posted in the the Palestine Gazette. 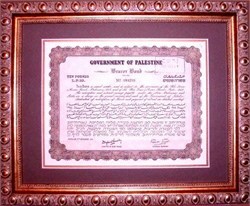 This bond was issued prior to Israel becoming a State in 1948. This historic certificate is framed in our classic, wood frame which is 1 1/4" wide with an overall size of 13 1/4" x 16 1/4". Archival mounting, acid free backing, double matting and clear glass are used in framing this certificate.